‘The Lion’s Blaze‘ centers on a group of four friends who when they were young, loved playing the old school video games. Suddenly, like Tron, they were transported inside the video game and have been trapped there for the last 15 years. The friends have been trying ton find a way out and learn the levels and other characters in the game. However, one of their friend’s dies in the video game, which sets the story in motion in that the remaining three friends must locate and find five magical stones to revive their fallen friend and escape the game, to which one of the surviving characters says, “that could take years”. 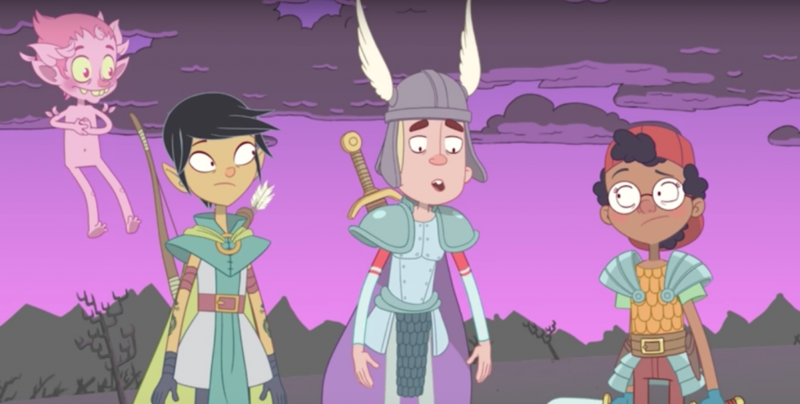 It’s a fun, short cartoon that should make expert and beginning gamers laugh out loud with such jokes as cheating in video games and multiple references to the beloved classics. From the mind of Olan Rogers, this nutty, yet super fun video game show is quite appealing and looks great in animated form. The voice work is solid all around, which one voice in particular reminds me completely of Will Arnett as LEGO Batman Movie. Again, ‘The Lion’s Blaze‘ has a lot going for it with some very adult humor in the vein of Rick and Morty along with some great video game references. I can see myself watching this show for the long haul. Catch it if you can. This entry was posted on Monday, August 7th, 2017 at 6:54 pm	and is filed under News, Television. You can follow any responses to this entry through the RSS 2.0 feed. You can skip to the end and leave a response. Pinging is currently not allowed. « Film Review: ‘[The Dark Tower]’! !